No wind this morning. Totally calm, but foggy. 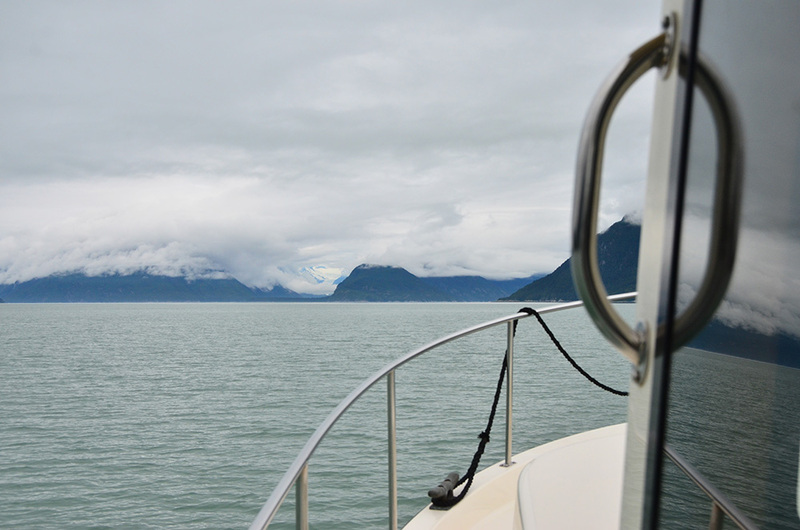 Thankfully the dozens of gill-netters that were working Lynn Canal yesterday were nowhere to be found. Dodging them in quarter mile visibility wouldn’t be fun. We pushed north on glassy seas. 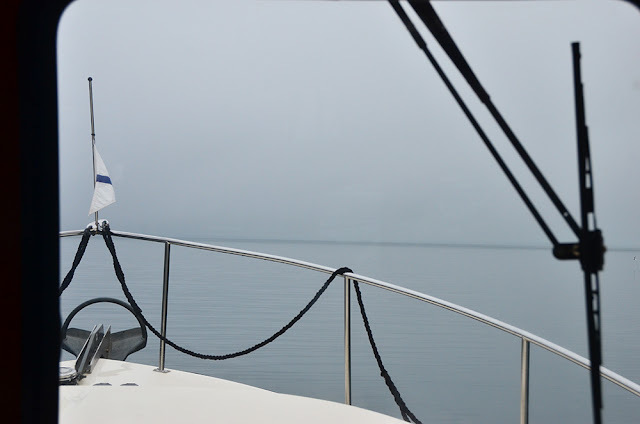 The current pushed us north, too—I routinely saw 9.5 knots speed over ground at an 8-knot throttle setting. The radar screen remained empty. After about 20 miles the fog began lifting. 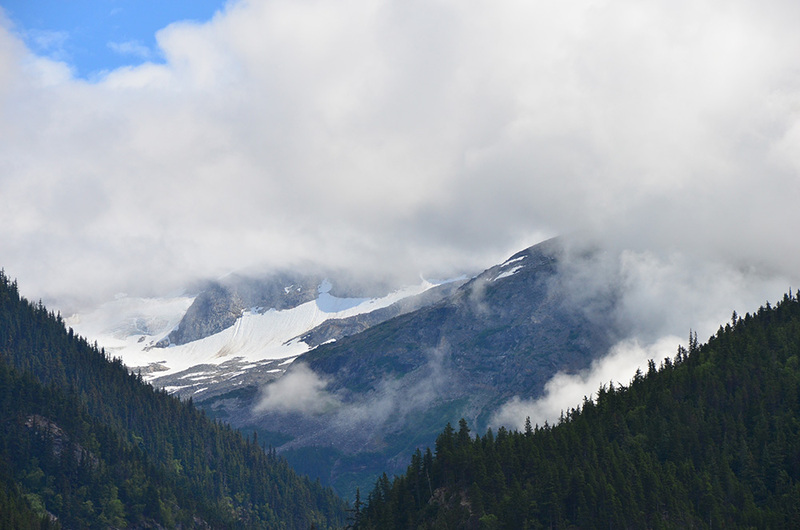 We spotted a few glaciers in the surrounding mountains. Given the dreary weather, we opted to keep going. No reason to stop at a picturesque anchorage if we couldn’t see anything. 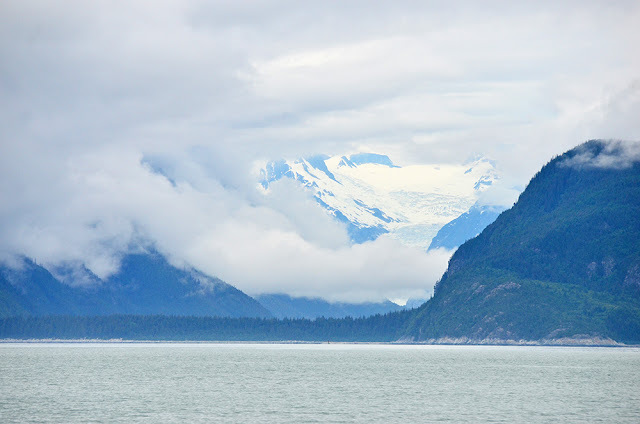 Dozens of glaciers are visible from Lynn Canal. This is one of them. And so it went. Past one anchorage after another, past Haines, until we arrived at Skagway around 1:00 p.m.
I’ve long wanted to visit Skagway. Maybe it was the elementary school history lessons on the Klondike Gold Rush. Or perhaps Yukon Trail, one of two computer games (the other being Oregon Trail) I was permitted to play as a youngster. Or maybe it’s just Skagway’s location as the northernmost point on the Inside Passage. 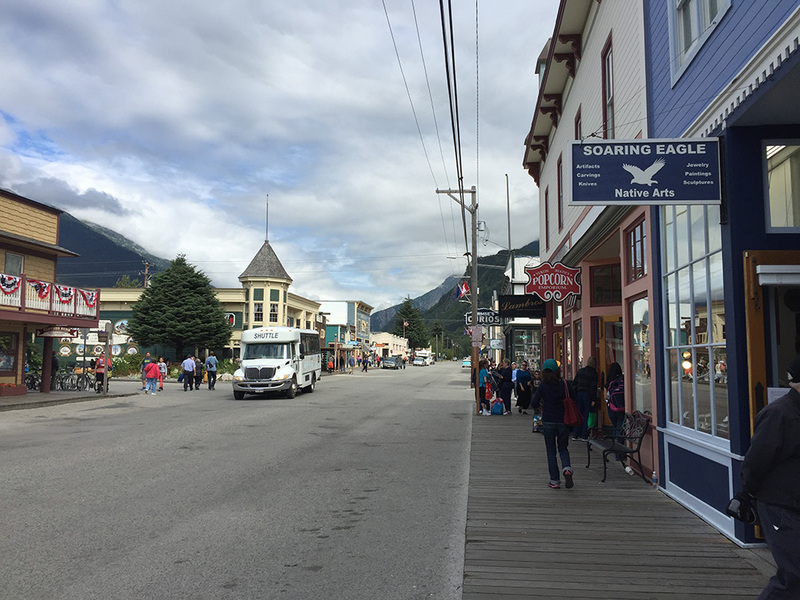 Regardless, Skagway was a bit of a disappointment. We arrived while four hulking cruise ships occupied town. The neareast to us was the Disney Wonder, which blared the soundtrack from Frozen for much of the afternoon. 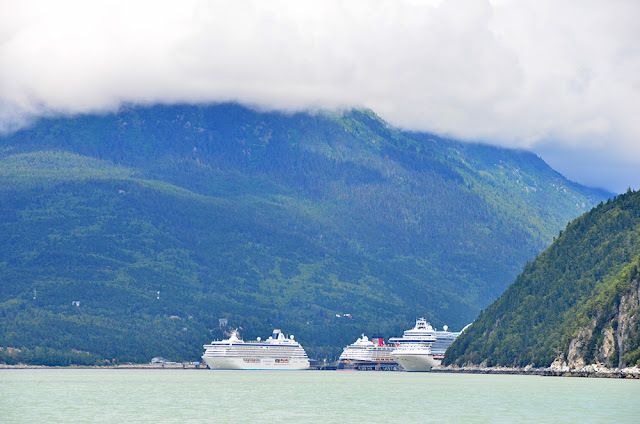 Ashore, Skagway wasn’t much better. A town of 700 full time residents just can’t absorb 8000 tourists easily. Wandering the streets we found dozens of jewelry shops, all advertising “specials” and offering the same free “train charm” for entering the shop. The restaurants and bars were filled to capacity during the day. We visited the National Park visitor center and watched the movie about Klondike history. In 1897, 100,000 people made their way to the Klondike during the gold rush. Hardly any struck it rich. Many died. Skagway was one of the jumping-off points for the trip through the interior. Back in the day, it was a pretty rough-and-tumble place: shootings, brothels, etc. Today, it’s a tourist trap. Actually, that’s not entirely true. After the last ship left (about 8:00 p.m.) we wandered back through town. The brewery had good beer and a pleasant staff. The Red Onion Saloon, crowded to overflowing during the day, had live music, reasonably priced drinks, and no cover charge (like during the day). Locals were friendlier, too.